Despite being on the run and seeking out help, Dex is no slouch, which she proves as she fights her way to the meetup. She roughs up a couple of cops before descending into the sewers where she fights her way past several gang members, and eventually she meets someone who offers to help her out… if she is willing to help him in return. Or, if the player has spent some skill points on the lockpicking ability, Dex can break free on her own. 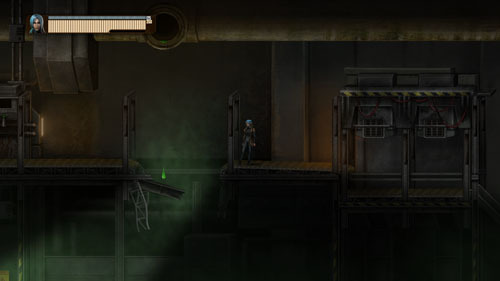 This is just one of many ways where the player is able to control his fate throughout the course of the adventure. Completing tasks and taking down bad guys grants you XP, which allows you to level up and acquire skill points that may be spent as you like across an array of abilities. You can choose to focus your skills on health, melee attacks, guns, or hacking. And there are perks like lockpicking, charisma, and bartering that allow you to enter locked areas, add dialogue options for persuasion, or get a better deal on your purchases. Depending on how spend skill points, your experience can change drastically. You may customize your character with high weapon skills and lots of health, which lets you equip the best guns and absorb a lot of damage. 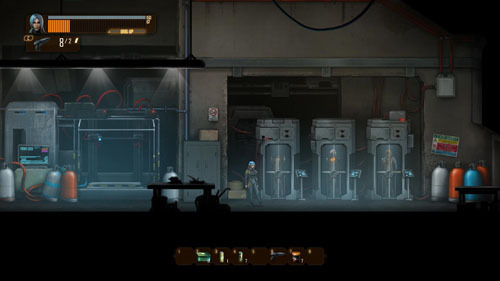 Or you can focus on lockpicking and hacking to take an indirect route, accessing blocked areas, disabling security systems remotely, and taking down bad guys with stealth where possible (though some enemies are immune). Or you can upgrade your melee skills and fight your way through the game with your fists, letting you save money on guns and ammo to stock up on health restoratives. In addition, you may elect for body modification and purchase implants that give you new abilities. These include immunity to poison gas or electricity and the ability to jump incredibly high, which allow you to take otherwise inaccessible paths. Several upgrades give you an advantage in combat by increasing your targeting, damage output, and ability to absorb damage. 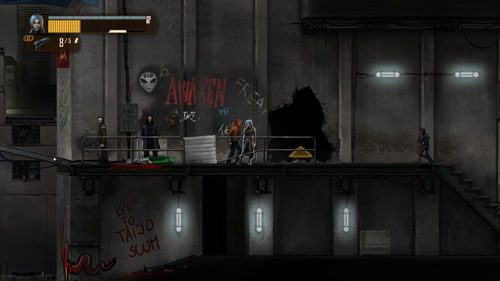 Some aid in stealth by showing you enemy vision cones or granting you temporary invisibility. And one of the best upgrades (which is similarly expensive) allows for health regeneration over time. 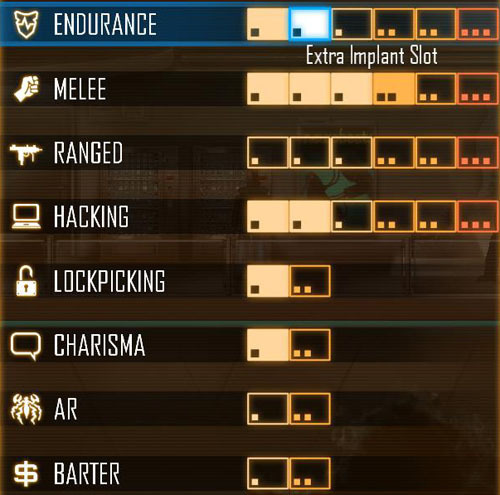 You can only apply a certain number of implants, so you need to choose something that fits your playstyle, although there are items and upgrades that open additional slots. No matter how you chose to play, you’ll meet a lot of colorful characters, almost all of whom are out for themselves in one way or another. Nobody is willing to help you for free, but it’s up to you how you go about completing the tasks they assign you. With lockpicking skills, you may be able to steal what you need, or with a high charisma skill, you might be able to persuade someone to give you what you want… and you can usually kill your way through any situation. 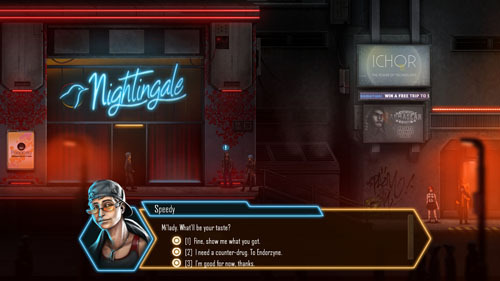 There are dialogue trees throughout the game, but most do not feature permanent consequences to following one branch versus another, as most are simply accepting or rejecting a given quest. However, there are a couple of occasions where dialogue choices can have major impacts to what follows. Most quests are entirely optional, and there are entire sections of the city that you can largely ignore, but completing side quests is the best way to get the tools you need to move forward, and this is also the best way to earn XP to further upgrade your character. That said, there is not fast travel system, and if you want to complete every quest the game sets out for you, you’ll be spending a lot of time hoofing it from one side of the city to the other. While you’re generally free to complete quests as you choose, most of them simply involve retrieving objects or information and bringing them back to the quest-giver. On the other hand, the world is almost completely open, so you can also venture off on your own to explore the city – so long as you have the skills to overcome the enemies and obstacles before you – and complete quest objectives before you know what to do with them. There are lots of rewards for exploring thoroughly, mostly in the form of health restoratives, salable items, and XP-increasing data chips, but there are a few important items that can be found by hunting around and solving puzzles, such as changes in clothing that grant you new abilities. 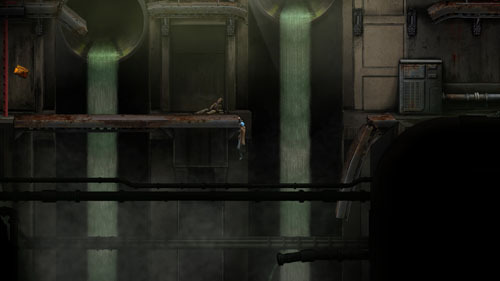 Dex has the ability to run (though not very quickly), crouch, walk while crouching, perform a dodge roll, climb ladders, and grab ledges to ascend or descend. Players must be mindful of dropping down from high platforms as Dex takes fall damage, with longer falls draining more of her XP, potentially enough to kill her. 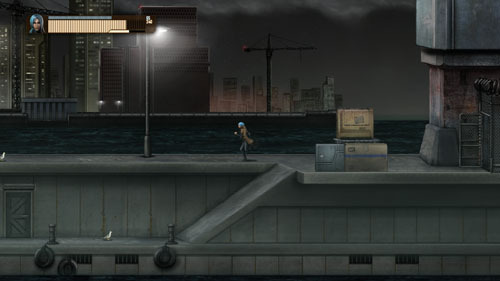 Her starting combat abilities allow her to handle low-level guns, as well as punch, jump kick, and block. Blocking is incredibly important, as it’s easy to take a ton of damage in hand-to-hand combat, and skilled players can even take down armed foes. Players must be mindful of attack animations to block when appropriate, and watch for a red exclamation point which indicates an enemy is about to unleash an unblockable strike, which may be avoided by running away or performing a dodge roll. 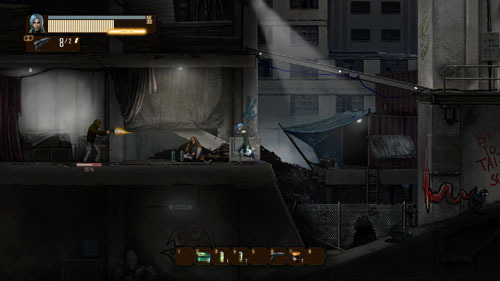 Defeated enemies may be looted for a bit of money and minor items, but most of the best loot is found by exploring the surrounding environment. Overall, combat is a bit slow and imprecise, and enemies aren’t terribly intelligent, which removes some of the weight of your choice in upgrades given that most enemies can be defeated using the same tactics. 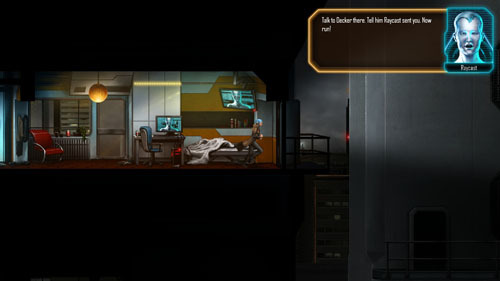 The game’s design is clearly focused on worldbuilding and storytelling over snappy mechanics, with more weight given to the “adventure” portion of the action-adventure genre. But despite its shortcomings, the lack of combat complexity does not detract from the overall experience, as defeating enemies is always used as a means to further the story. Importantly, the world is persistent, so killed enemies remain killed for the duration of the game. In most cases, if you walk into an area and wipe out everyone, you are free to return to that area in the future and there will be no enemy presence… although certain narrative elements do call for more powerful enemies to enter certain areas late in the game. You can even stealth kill a couple of enemies and come back hours later to finish off the rest, with the ones you killed still dead, which lets you retreat and heal if you get in over your head. On top of this, you are able to save your game whenever you like (a feature added in the Enhanced Version of the game), and you can save often to avoid repeating gameplay. Unfortunately, there are a lot of opportunities early on to get yourself killed with little or no warning. Sometimes, you enter a doorway and are immediately attacked by several enemies at once, resulting in a huge health loss and possibly an unceremonious death. You may also find yourself walking into danger that you weren’t immediately aware of, such as poison gas that quickly drains your health, or a mounted turret that blasts you with machine gun fire, draining huge chunks of your health as you attempt to run away. There are also some occasions where the art style doesn’t allow for enough contrast between interactible and noninteractible platforms, resulting in you jumping for a platform that you can’t actually stand on, and sometimes falling to your death. 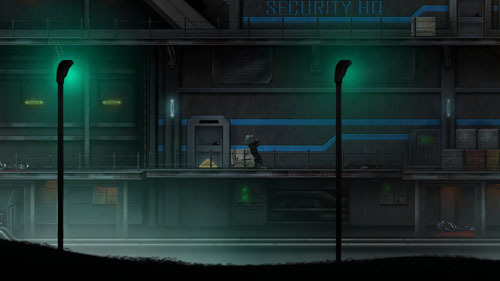 As with most cyberpunk games, hacking plays a key role, and here it takes the form of a twin-stick shooter. 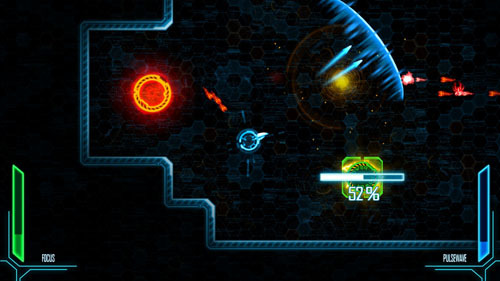 When you hack into a computer, you control a mobile turret that is able to shoot a steady stream of weak projectiles (which may be upgraded by spending skill points). In cyberspace, you blast security programs that come in the form of turrets, homing projectiles, and flying enemies. 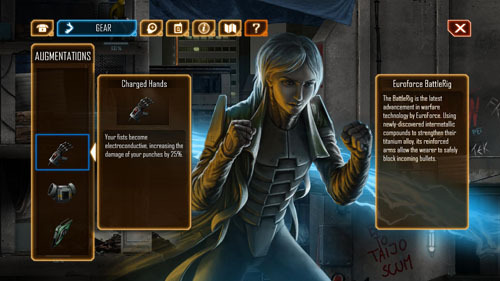 By destroying shields and power cells, you can reach new parts of these confined areas to uncover hidden information, disable security systems, and even pick up a bit of money and XP. You can even hack enemies in the real world in order to stun them for a moment. 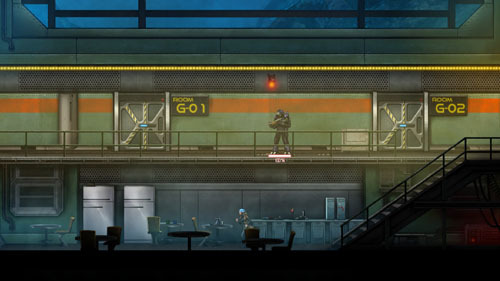 Gameplay in these sequences is quite simple and does not vary significantly from one hack to the next, nor are the environmental designs or enemies terribly engaging, but players who wish to take a stealthy approach will definitely want to hack any systems they come across. There are a few minor glitches to be found across the game, including some interface issues where the names of items disappear from menus, or where contextual button prompts won’t disappear without reloading a save. The game features a neat vision cone feature where you can’t see enemies if they are blocked from the perspective of Dex, but this also leads to a weird circular shadow effect whenever you reach the edge of the screen. There are also some minor design issues. 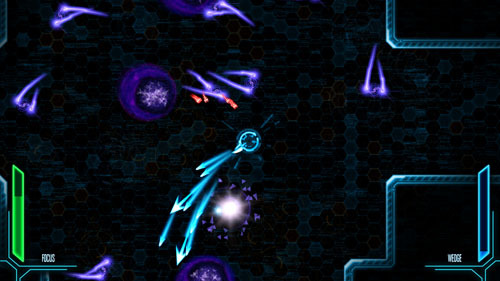 For instance, in hacking sequences, turrets only react once you’re within a certain distance of them, but the screen resolution means you can see and destroy them without retaliation when you approach from the sides. 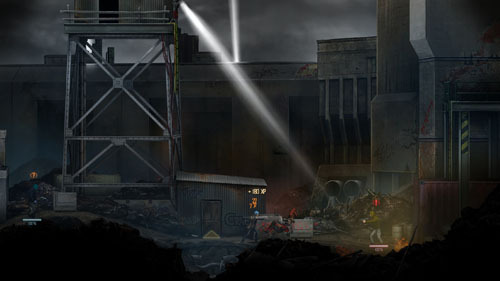 However, approaching them from the top or bottom results in them appearing onscreen and opening fire immediately without giving you time to react. Also, in one instance, the player is given the ability to disable turrets to a certain area, but they remain active (because you are actually disabling a different set of turrets for a separate mission later in the game). Only by hacking a second computer and disabling security systems do the turrets actually deactivate… which can lead to a nasty surprise if you walk into a room full of turrets thinking they have been rendered inert. 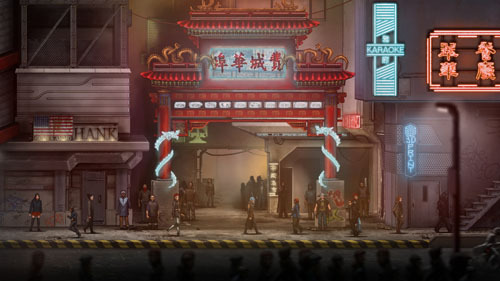 The game features a hand-drawn art style with loads of fine details that show an aged and well-worn cityscape that is divided into several unique districts. The world feels gritty and lived-in with people going about their lives as the player moves about and uncover the city's workings, which is supported by writing that engages and immerses the player in the complexities of life in this world. The game is fully voiced as well, although most characters speak quite slowly, so you may find yourself sticking with the written dialogue. 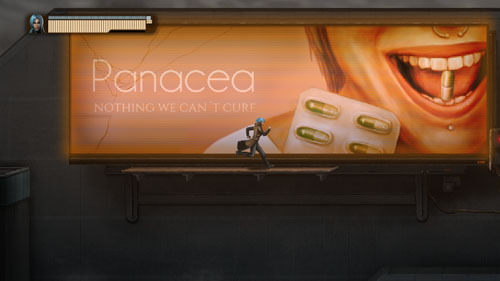 The game is accompanied by a suitably intense soundtrack, but the sound design lacks a similar punch. Dex was developed by Dreadlocks Ltd., a studio based in Prague, Czechia and founded in 2011. The studio also developed Rune Legend for mobile devices, as well as the Mimpi series.